This year again, on occasion of the most important International showcase for consumer electronics, the CES Show in Las Vegas, Elettromedia took the opportunity to introduce its new technologies for 2013; a strongly awaited date by Audison and Hertz fans for a sneak preview of Elettromedia’s R&D latest projects. The 2013 International Consumer Electronics Show was held from January 8th to 11th in Las Vegas. The Elettromedia staff’s passion, know-how and bent for innovation received world acknowledgement with a resounding triumph: the guests in the showroom were taken aback by the sound coming out of the democars on display. For the Audison brand, a Porsche Cayman S, called “Audison bit Drive & Full DA car”, was presented to the audience. The car is equipped with Audison player bit Play HD (demo version), bit One processor, two AV Quattro amplifiers with digital module AV bit IN, Audison Voce loudspeakers and two Hertz subwoofers. The entire project was engineered by the specialty store “Mobile Solutions of Calgary” (Alberta, Canada). 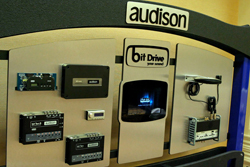 It is the first time Audison presents an audio system exhibiting its most innovative technologies, Full DA and bit Drive, and the result is such an exciting glory of sound to impress even the most demanding car audio enthusiasts. Among the new products to receive the first excited comments was also the new Audison Prima line, a worldwide preview presentation featuring amplifiers and loudspeakers developed in synergy. The other two cars in the showroom were a Fiat 500 and a Scion IQ. The Fiat 500 featured an Audison bit Ten processor, a brand new Energy.5 ESK165.5 system and a Hertz DS 250.3 subwoofer, powered by a Hertz HCP 5D amplifier; a system set up by Traffic Jamz – Southern California. The second democar, with full Hertz system, was a Scion IQ featuring DSK 165.5, DCX 165.5, DBA 200.5. The Hertz brand area was dedicated to the HCP and Energy.5 lines, already launched in the second half of 2012, and to the new HP amplifiers, which add to the SPL Show line. Besides trainings and business meetings, Elettromedia organised for its guests an exclusive and pleasant event, liven up by the concert of Michael Grimm, the winner of America’s Got Talent 5th edition.